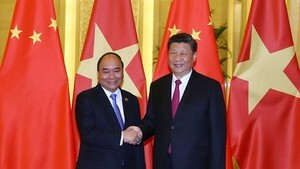 The President revealed his intention in a written interview granted to Vietnam News Agency before he, together with his spouse, is making a State visit to Vietnam from March 22-24 at the invitation of President Tran Dai Quang. The interview dealt with a wide range of issues, including the relations of the two countries and measures to bolster it and matters relating to peace on the Korean peninsula. - Mr. President, what is the significance of your state visit to Vietnam this time? 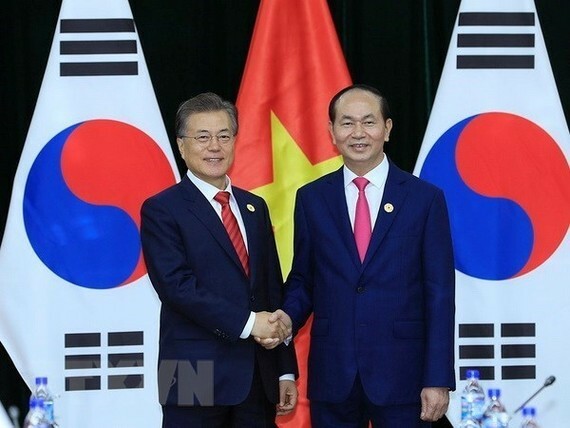 RoK President Moon Jae-in: I am very pleased to visit Vietnam again just four months after I went to Da Nang to attend the APEC Economic Leaders’ Meeting. This is also my first overseas trip this year. Immediately after taking office last May, I sent a special presidential envoy to ASEAN member states, including Vietnam. I was the first RoK President to do so. At that time, the RoK delegation led by the envoy was warmly welcomed by General Secretary of the Central Committee of the Communist Party of Vietnam Nguyen Phu Trong, President Tran Dai Quang and Prime Minister Nguyen Xuan Phuc. I met with Prime Minister Phuc on the sidelines of the G20 Summit last July and President Quang during my stay in Da Nang last November to attend the APEC Economic Leaders’ Meeting. Through these two occasions, we had extensive in-depth discussions on ways to further deepen friendship and cooperation between our two countries. I have met with the Vietnamese leadership so often because Korea-Vietnam relations are very special. Since the establishment of diplomatic ties in 1992, the RoK and Vietnam have worked together to achieve remarkable progress on all fronts, including politics, the economy, culture and people-to-people exchanges. Especially since 2009, our two nations have intensified and advanced our strategic cooperative partnership. Building on historic and cultural similarities and complementary economic structures, our two countries have developed a level of bilateral cooperation that can set an example for the world. Bilateral trade surged after the Korea-Vietnam FTA came into effect at the end of 2015, reaching 63.9 billion USD in 2017. Vietnam has now emerged as the RoK’s fourth largest trading partner while the RoK has become Vietnam’s second biggest trading partner. In addition, the RoK is the largest investor in Vietnam with an accumulated investment amount of 57.9 billion USD. Vietnam is a crucial investment destination for the RoK, which is evidenced by the fact that more than half of Korean businesses (some 5,500 out of about 8,600) operating in the ASEAN region have a presence in the country. At the same time, Vietnam is the RoK’s primary Official Development Assistance partner (ODA), and the RoK is the second largest ODA provider for Vietnam. Over the past 30 years, a variety of development cooperation projects totaling 1.65 billion USD have been carried out in Vietnam. Moreover, Vietnam has the most people-to-people exchanges with the RoK among ASEAN member states. In 2017, approximately 2.7 million visitors traveled back and forth between our two countries. There are roughly 170,000 Vietnamese nationals residing in the RoK while some 150,000 Koreans are staying in Vietnam. As such, Vietnam is a key partner and invaluable friend for the RoK. Through my state visit this time, I intend to further deepen friendship and trust with the Vietnamese leadership. Based on this, I hope to elevate our strategic cooperative partnership a step higher. In addition, I hope our two nations will be able to respond effectively to the Fourth Industrial Revolution, one of the most-talked-about issues across the globe, and create future growth engines together, thereby laying a solid groundwork for building mutually complementary, future-oriented cooperative ties. Furthermore, I plan to meet with Vietnamese business leaders, people from Korean-Vietnamese bicultural families and ordinary Vietnamese citizens during my visit, with a view to expanding common ground between our two peoples and further cementing our friendship. At the RoK-ASEAN Summit held in November last year, I unveiled a vision of creating a future RoK-ASEAN community and spoke of my determination to comprehensively upgrade cooperation with ASEAN member states. My visit this time will serve as a chance to lay out a blueprint for the development of the future RoK-ASEAN community through RoK-Vietnam cooperation that will make exemplary progress in all aspects. - Mr. President, will you please explain in detail your initiative of the New Southern Policy announced at the APEC Economic Leaders’ Meeting in November 2017? RoK President Moon Jae-in: I have a firm conviction that the RoK and ASEAN can make an optimal partnership that can work to achieve growth and carve out the future. It does not simply mean economic growth. Approximately 500,000 people from ASEAN live in the RoK, and some 300,000 Koreans reside in ASEAN member states. With economic cooperation deepening further and people-to-people exchanges becoming more vibrant between the RoK and ASEAN countries, it is more important than anything else to forge a stronger connection among the peoples of the two regions. For this reason, I gave high priority in diplomacy to relations with ASEAN after I took office and later announced the New Southern Policy in an effort to upgrade RoK-ASEAN ties in all sectors. I envisage a peace-loving, people-centered community where all people prosper together in both the RoK and ASEAN. First and foremost, I intend to pursue cooperation focusing on people. My governing philosophy of “people first” and ASEAN’s pursuit of a people-oriented, people-centered community seem to share a common goal. The RoK-ASEAN partnership will eventually evolve into a forum participated in by the peoples of the both sides, and based on mutual understanding and support. Importantly, the RoK Government will take interest in promoting capacity building in ASEAN and increasing RoK-ASEAN mutual interaction, continuing to channel its efforts into expanding various training programs in the RoK and improving the visa issuance process. At the same time, we will continue to work to widen exchanges among young people, the ones who will take responsibility for the future of RoK-ASEAN relations. Second, I will pursue continued expansion and progress of cooperation between the RoK and ASEAN in a way to benefit all people in the region through mutually beneficial cooperation to promote common prosperity. For the sustainability of cooperation, it is critical for all countries concerned and their peoples to make progress together. We have to establish a framework of mutual prosperity so that the RoK's development accelerates the progress of ASEAN, which in turn reinforces the advancement of the RoK. As the free flow of people and goods over borders constitutes a basis for economic prosperity, the RoK will expand its contributions to promote connectivity in ASEAN and creating an ASEAN Community. Third, a focus has to be placed on creating a peaceful community where public safety is guaranteed. Currently, the Asian region is facing various conventional and non-conventional threats, including the Democratic People’s Republic of Korea (DPRK)'s nuclear and missile programs, terrorism, violent extremism and cyber attacks. None of these threats can be addressed by the efforts of a single country alone. To ensure that the peoples of the RoK and other ASEAN member countries can go about their everyday lives in safety, the RoK Government will enhance cooperation with the government of each ASEAN country at both bilateral and multilateral levels. Vietnam is a key partner for the RoK Government in pushing its New Southern Policy. This partnership is well-evidenced in such sectors as trade, investment and people-to-people exchanges. I hope my visit this time will serve as a crucial milestone in promoting the future-oriented progress of ties between our two nations and building a peace-loving, people-centered community where all people prosper together in the region. In which directions would you steer Korea-Vietnam economic cooperation in the years to come? RoK President Moon Jae-in: The two key phrases that I have in relation to economic cooperation between our two nations are "mutually beneficial cooperation" and "cooperation for common future growth." When it comes to mutually beneficial cooperation, I am convinced that economic cooperation between two nations can only be sustainable when both parties enjoy the benefits. I will pursue economic cooperation between our two nations in a mutually beneficial way that contributes to our common prosperity. Last year saw bilateral trade amount to 63.9 billion USD, an increase of more than 40 percent in one year, and thus, the RoK became Vietnam's second largest trading partner while Vietnam emerged as the RoK's fourth largest trading partner. The realization of the goal of increasing bilateral trade to 100 billion USD by 2020 is making smooth headway, and currently, economic cooperation remains brisk as demonstrated by the fact that the RoK emerged as the largest investor in Vietnam with investments amounting to 57.9 billion USD. The RoK Government will strive to address trade imbalance between our two nations through cooperation in the parts and materials industry and automobile industry, which is being pushed for mutually beneficial enhancement of industrial capabilities, as well as through various cooperative projects aimed at strengthening Vietnam's competence in the export of agro-fishery products. In addition, it is very important for our two countries to make joint endeavors to prepare for the Fourth Industrial Revolution and create future growth engines. I hope bilateral cooperation in new industries such as the Smart City and ICT will strengthen the foundation to promote future-oriented economic cooperation between our two nations. During my upcoming visit, I am planning to attend the groundbreaking ceremony for the Vietnam-Korea Institute of Science and Technology (VKIST), which I think is a fine example of "mutually beneficial cooperation" and "cooperation for common future growth." The Korea Institute of Science and Technology (KIST), the model of the VKIST, was founded 50 years ago in line with the RoK Government's initiative to invest foreign aid funds in its future by nurturing science and technology, including industrial technology, instead of securing food to address the immediate hunger of the people. Since then, the institute has served as a cradle of science and technology education, fostering numerous talented individuals who contributed to the development of the country's key strategic industries such as automobiles, electronics and heavy and chemical industries. It has thus worked as a driving force behind the RoK’s industrialization and economic development. I hope the groundbreaking for VKIST this time will be remembered as a historic occasion that marks a crucial milestone in Vietnam's development into a modern industrialized state. The RoK will continue to seek ways to promote mutually beneficial cooperation that can make contributions to Vietnam's plan to build a modern industrialized state by 2020. - Congratulations on the RoK's successful hosting of the PyeongChang Winter Olympics. In consideration of the recent feat of Vietnam's national under-23 football team, which is led by Korean head coach Park Hang-seo, do you have any vision for cooperation in sports between the RoK and Vietnam? RoK President Moon Jae-in: The PyeongChang 2018 Olympic and Paralympic Winter Games came to a successful close as a festival of peace and harmony of all peoples with the participation of the largest number of athletes ever for the Winter Games. It served as a chance to realize once again the potential of sports to connect people and inspire their passions. One Malaysian Olympic figure skater was known to have begun dreaming of competing in the Olympics by participating in the Dream Program, which is sponsored by the RoK. Envisioning a Vietnamese athlete participating in the Winter Olympics in four years, the RoK will work together with Vietnam to this end. I would like to take this opportunity to wholeheartedly congratulate Vietnam's national under-23 football team on finishing second under the direction of head coach Park Hang-seo in the 2018 AFC U-23 Championship in late January. I am pleased by the fact that the feat symbolically demonstrated the "Korea-Vietnam Magic" that anything can be achieved if the RoK and Vietnam join forces together through sports. At the Rio 2016 Olympic Summer Games, Hoang Xuan Vinh, a sports shooter, accomplished the feat of winning the very first Olympic gold medal for Vietnam under the direction of his coach Park Chung-gun. Now members of the Vietnamese national teams in seven different disciplines, including soccer and shooting, are training hard under the guidance of Korean coaches. I hope they will enjoy even better results in the months to come. The RoK Government intends to continue expanding bilateral cooperation in sports to create yet more Korea-Vietnam Magic. I hope the Vietnamese people will be able to fully feel a growing sense of the friendship between the two countries, which is being cemented every day through sports. - What is your assessment of the role of people-to-people exchanges between the two countries, especially the role of businesses and residents, including students, in the other country? RoK President Moon Jae-in: Among the ASEAN member states, Vietnam has the largest number of people-to-people exchanges with the RoK as well as the largest number of Korean businesses in operation. The people and businesses involved in these bilateral exchanges and cooperation are acting as both engine and bridge, making it possible for Vietnam and the RoK to build a genuine partnership. Last year, the number of Vietnamese and Koreans visiting the other country surpassed 2.7 million. Now around 150,000 Koreans reside in Vietnam, while about 170,000 Vietnamese live in the RoK. In addition, Vietnam is the RoK’s biggest investment destination. Around 5,500 Korean businesses operate in Vietnam, strengthening our bilateral economic cooperation. Most of all, about 70,000 bicultural families in the RoK (which include many Vietnamese nationals) are connecting the peoples of our two countries as “one family through in-law relationships.” Moreover, I believe that they are invaluable assets that will lead the development of bilateral relations in the years to come. I feel delighted and reassured about the fact that young peoples of the two nations - the leaders of the future generation - are involved in cultural exchanges, including the spread of the Korean Wave, and are raising the level of mutual understanding, forming empathy and deepening friendship. I heard that the number of Vietnamese students studying in the RoK is rising rapidly, doubling from 7,000 in 2016 to 14,000 in 2017. Their areas of study are also becoming more diverse. I am very pleased with the increasing number of Vietnamese students in the RoK and the continued diversification of areas of their study. I intend to take an interest in the issue and provide necessary support for them so that they will grow into a bulwark of the development of our bilateral partnership in the years to come. A while ago, my wife invited Vietnamese students studying in the RoK to Cheong Wa Dae. She said she was proud of the students who were studying hard to gain knowledge and technological expertise in various areas, dreaming of making contributions not only to their country but also to the development of the relationship between our two countries. I heard that President Ho Chi Minh selected talented young individuals and sent them to study abroad even during difficult times. The students, who devoted themselves to studying abroad by upholding the profound intention of Bac Ho, later returned to Vietnam and played significant roles in achieving the development of their country of today. The fervor for education, which makes it possible to take great interest in the development of the next generation and to spare no expense on it, is a virtue that our two countries have traditionally maintained and developed. I believe that this fervor is also leading the mutual prosperity and development of our two countries today and bringing their peoples ever closer. - What is the Korean Government’s plan for the peace and future of the Korean Peninsula? RoK President Moon Jae-in: The RoK Government is doing all it can to open a new era of peace and prosperity on the Korean Peninsula through the denuclearization of the DPRK. The DPRK’s nuclear and missile programmes have impacted peace and security not only on the Peninsula and in Northeast Asia but also in the entire world. The RoK Government has made all-out efforts together with the international community, including Vietnam, to rally all resources to denuclearize the DPRK and establish a peace regime on the Korean Peninsula. As a result of these efforts, the foundation for talks between the two Koreas and an improvement in inter-Korean relations was created through DPRK athletes’ participation in the PyeongChang 2018 Olympic Winter Games in February, the formation of a united women’s ice hockey team and high-level DPRK delegations’ visits to the RoK. Furthermore, this also created an atmosphere for dialogue between the DPRK and the international community, including the United States. In early March, RoK special envoys visited the DPRK and met with Kim Jong-un, the Chairman of the State Affairs Commission of the DPRK, and made an agreement to hold an inter-Korean summit in late April. U.S. President Donald Trump also said he would meet the DPRK leader by May, an indication of continued efforts and development for talks on the Korean Peninsula. The RoK Government intends to carefully use this hard-won opportunity and make progress in a prudent and poised manner. My appreciation goes to the Vietnamese Government and people for so far actively supporting the RoK Government’s policy on the Korean Peninsula. I also ask for constant interest and active support in the months to come.